Arrive Cochin, pick-up from airport or railway station and straight drive to Munnar, one of the most popular hill stations in southern India known for its sprawling tea gardens. Arrive Munnar and check in hotel. Evening go for a stroll in tea gardens. Night stay in Munnar. After breakfast proceed on a sightseeing tour of the picturesque Mattupettu Dam and Echo Point. Also visit Top Station, Eravikulam Park, Anamudi etc. Evening free at leisure. Night stay in Munnar. After breakfast and drive to Thekkady. Set in the heart of the Cardamom Hills of Kerala is Periyar National Park and Tiger Reserve, offering a rare opportunity to enjoy South India's wildlife. Arrive Thekkady and check in hotel. Afternoon visit spice plantations. Night stay in Thekkady. Morning after breakfast enjoy a boat safari on Periyar Lake to view the varied fauna of this region (optional). Afternoon visit Spice Plantations. Night stay in Thekkady. After breakfast and drive to Kumarakom a charming village on the Vembanad Lake. Arrive Kumarakom and check-in at hotel. Later visit Kumarakom. A small backwater village which lies along the backwaters of Kerala with a bird sanctuary overlooking the Vembanad Lake. 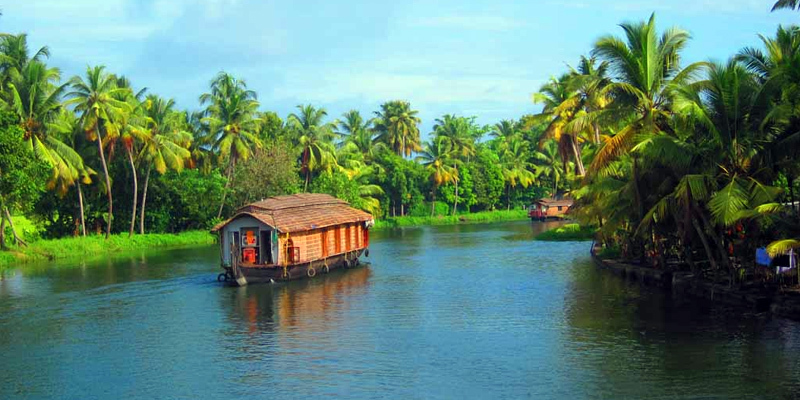 Here you can get a feel of the essence of a typical village life of Kerala. Night stay in Kumarakom. Morning departure transfer to the airport to board the flight for onward journey. Tour ends with sweet memories..